As a Baefamily, I've decided to post one photo of BYJ a day. I don't know if I could do this every day...but I'll try. It will help me when [very rare] I can't find anything to say to fill this blog. There are a lot of pictures of BYJ, of course him being a model and all, it is natural. For my colleagues, friends and family outside of Baeworld, who are surprised..even shocked, maybe...that I've 'gone public' on being a Baefan : this is who I am, I'm still the person you knew from 'way back when' and nothing has changed. I haven't suddenly gone loony. It's just I've decided my being a Baefamily could be a motivation for me to do many positive things in life. No, my hubby is not angry, he supports me in every way. So does my family. 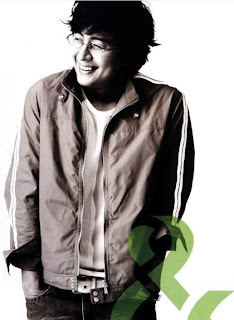 Being a fan of Bae Yong Joon at my age does not mean I've gone over the deep end. P.S : Enjoy the Photo.